Smart SupplementationTM is a free series of educational literature created by Huntington College of Health Sciences (HCHS) as a public service. Although copyrighted, it may be freely photocopied and distributed, but may not be altered in any way. Smart SupplementationTM is not intended as medical advice. For diagnosis and treatment of any medical condition, consult your physician. Aloe Vera is a succulent member of the lily family, originating in Africa, where most of the genus Aloe is indigenous. The name Aloe is from the Arabic alloeh, or Hebrew halal, meaning a shining bitter substance. The inner leaf contains a slimy gel used in medicines and cosmetics. The outer leaf tissue contains the yellow bitter juice which is known as aloe drug or “bitter aloe,” and is used primarily as a laxative. Today, Aloe is commercially grown in the Southwest and Mexico. Mainstream medicine still tends to turn its nose up to Aloe and will probably continue to relegate the plant to “folk remedy” status, at least until its mechanisms of action become less elusive. Like most botanicals, a lack of financial incentive discourages the investment of the necessary millions of dollars necessary for research. Most work on Aloe is undertaken by university researchers with limited budgets, often in cooperation with the Aloe industry. So, Aloe remains a folk remedy used internally for arthritis, stomach ulcers, and diabetes, and externally, for a plethora of skin ailments. The anthraquinones in the bitter latex part of the leaf yield the cathartic action of Aloe drug. The polysaccharide constituents exhibit antiviral and immunopotentiating activity. Specifically, acemannan has been documented to enhance the immune system by stimulating the production of macrophages, interferon, lymphocytes, and phagocytic white blood cells. 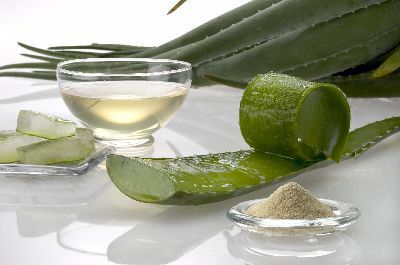 The mucilaginous gel is responsible for Aloe’s moisturizing powers, and contains salicylates, which possess anti-inflammatory properties and help to debride a wound of necrotic tissue. Enzymes in Aloe produce anti-inflammatory and analgesic effects by inactivating bradykinin, a vasodilator involved in immune chemistry. The mineral magnesium lactate blocks the formation of histamine which, when released, causes mucous membranes to swell. And, the essential fatty acid, gamma-linolenic acid (GLA), exerts a favorable effect on inflammation, allergy, platelet aggregation and wound healing, in addition to inhibiting something called thromboxane. Thromboxane is a protein which, released by injured cells as they die, invades the surrounding area, effectively killing adjacent cells. What else does Aloe do? Even when being rubbed gently onto the skin’s surface, Aloe has an amazing ability to penetrate the skin. It appears to slow down the emptying of the stomach and to inhibit the release of excess hydrochloric acid and the enzyme pepsin. Aloe increases tissue levels of several glycosaminoglycans. Glycosaminoglycans are skin components that influence wound healing. They prevent blood clotting, regulate inflammatory cell function, and form a scaffold for the collagen and elastic fibers that knit skin together. It has been shown to improve wound healing in diabetics by either lowering blood glucose levels or by stimulating the function of fibroblasts, the cells that make collagen. Aloe appears to block hydrocortisone’s inhibitory effect on wound healing. When given with the drug glyburide, Aloe was shown to improve blood sugar levels when the drug given alone, to the same patient, had not been effective. Anthraquinone-containing Aloe products may cause severe gastric cramping and should not be used by pregnant women or children. Additionally, all cautions applicable to any laxative should be heeded.